Here recently, Lisa Hessel Photography captured this romantic and exquisite wedding editorial with creative direction and styling by Lauren Field Design. And oh my goodness! It's a total swoon-fest! Organically "messy" blooms by Les Bouquets are a beautiful standout as is this amazing wedding cake design by Simone Faure of La Patisserie Chouquette. Now without further ado, let's let this dreamy scene whisk us away! Shall we? From the designer, "We were moved by the serenity and peacefulness shown in al fresco and still life paintings of the past with the deepest insight into the experience of life and nature." "We wanted to render beauty and celebration that artfully re-imagined these qualities of luminous light and regal splendor through vignettes that contribute to the fleeting experiential art of real life." Inspired by the rejuvenating pigments and delicate layers of these old world paintings, the designer developed a palette of soft hues paired with bold/deep accents. The procession of the bride through these spaces tells a story of sophistication and timeless beauty as she readies herself for a most sacred declaration. The expansive display of marble, wood, bas relief sculpture, and stone of the turn-of-the-century estate provided a stunning backdrop... From the designer, "We chose silver flatware, delicate crystal glassware, and Prussian blue striped napkins to set the table." The cake was embellished with gold ornamentation and quilted accents and the cutest little peach.... And the entire soirée was filled with simple yet decadent details layered with chic textures. The notion of the still life was realized with statuesque florals, antique brass candlesticks foraged from a local church, and vessels of shapely fruit. So beautiful and ethereal... This heavenly gown had me at hello... And just look at all of this timeless beauty... Gorgeous, gorgeous, gorgeous! So much attention to detail... Intricately patterned white gold chargers were layered with ivory velvet ribbon from France and metallic gold scripted place cards... ... 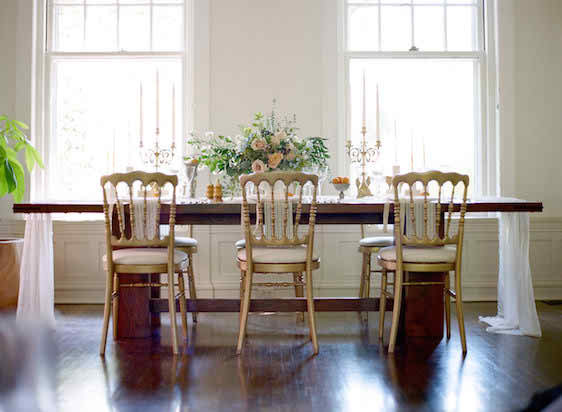 While Grand Versailles chairs flanked the hand hewn table overlooking the lush grounds. The invitations by Alicia Lantzy were hand painted in ombré blue on ivory and blush. The bride was adorned with layers of airy texture that allowed for graceful movement. This look was feminine and romantic with soft luxurious waves, a braided crown, and handmade lace boudoir ensemble. Alluring florals with organically shaped foliage added a touch of whimsy. Inspired by Leonardo di Vinci's famous quote that read, "Painting is concerned with all the attributes of sight; which are: Darkness, Light, Solidity and Colour, Form and Position, Distance and Propinquity, Motion and Rest," these wedding pros set out to evoke emotion through their dreamy and painterly interpretation. So much love goes to all of the talented wedding artists who came together to make this serene scene come to life! It's truly the stuff that wedding dreams are made of! 2 Comments " Regency Era Wedding Inspiration "
I love the cake white and blue. It's so pretty. Amazing dresses and this has been a great article so inspiring, I love it! I must know how can it be that we are in such a modern world, surrounded with start-ups, exits, and technology, but in my search for wedding planning I found such a little info, articles, posts with recommendation on a good event planning software I would expect that there will be a ton of recommendations from planners and brides on online systems to plan your event where you can create you very own wedding seating chart template by having tool to create wedding seating chart and just editing the layout per your request. Beautiful lace, exquisite design, and romance are sewn into the seams of our wedding dress. Made in strictly limited releases, say yes to the dress! Review Romance is the destination for bridal gowns. Lisa Photography is suprub. In Christian Matrimony,brides are wearing beautiful gowns.